Suffering his eighth retirement of this season, Christian Horner says “only Daniel” Ricciardo can say whether he is beginning to regret his Renault move. Ricciardo retired from Sunday’s Mexican Grand Prix while in the hunt for a podium finish. The pole-sitter suffered his sixth mechanical retirement and his eighth in total of 2018. He lashed out, saying the car is “cursed”. “I don’t think ‘frustration’ is the word anymore,” Ricciardo said. “Everything feels hopeless. “You know, honestly, now where I am, I don’t see the point of coming on Sunday, I don’t see the point of doing the next two races. Ricciardo had put his RB14 on pole position for the Mexican Grand Prix, a race won by his team-mate Max Verstappen. 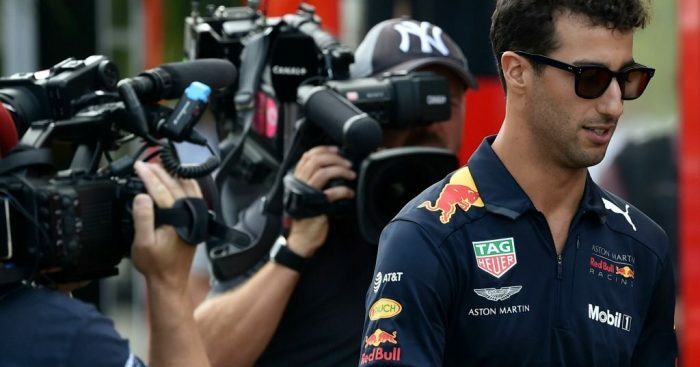 And with the majority of his mechanical retirements coming from engine issues, Horner was asked whether Ricciardo is regretting his decision to swap Red Bull for soon-to-be-ex engine partner Renault for 2019. The team boss replied to Motorsport.com: “Only Daniel can answer. “There’s no point broaching that with him – the decision was made, he was comfortable with the decision.